Russell Ruderman Sorts GMO Facts from Fiction??? 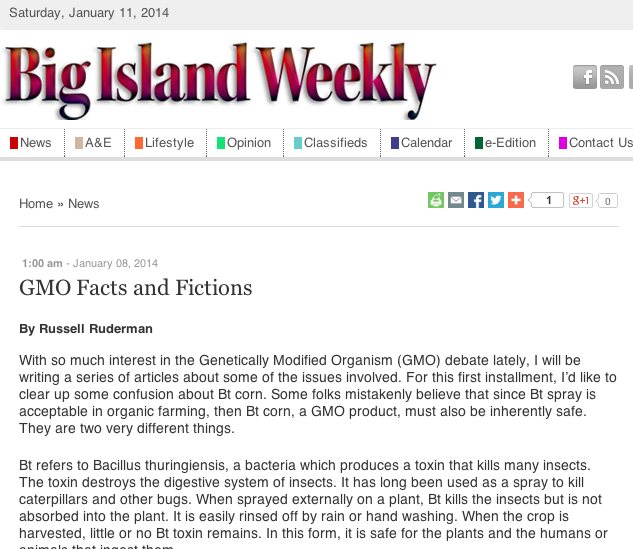 It’s really interesting that Senator Russell Ruderman who has a degree in biology and owns 4 natural food stores on the Big Island is now going to do a column about the facts and fiction of GMOs. Somehow, an organic shill plans on writing facts about something he has openly criticized? Of course his post lacks a shred of evidence or citation to back up his claims of facts. That is something very common on bogus articles, which leads us to the conclusion that he needs to rename his column as “GMO Fictions and Fears.” Fears are a great way to make a profit in those stores everyday! This entry was posted in Don't Post that A'ole, Intelligence Quotient, Pono Right to Know Politicians, Research 101 and tagged anti-GMO, Big Island, Bill 113, biotechnology, Puna, Russell Ruderman, Senator Russell Ruderman on January 11, 2014 by hawaiifarmersdaughter.